"I want to escape," I said, breaking the silence. "To where?" a voice replied, sounding confused. "I don't know. Just anywhere other than here. It feels like I just don't belong. It feels as if I am lost, caught in an endless cycle of just surviving but not living, an empty shell devoid of aspiration, passion and purpose. I mindlessly watch the days pass by, like how the cars on a busy road do. I don't feel like myself." "Then what do you want to do then?" the voice probed, now with a tinge of concern mixed into it. "You see, that I don't know either. I want to take my bag, step out of the door and just see what the world has to offer. To explore places no one has ever seen before, to journey across continents, to just be in the moment, and to bask in the experience. Maybe write a book about it," I said excitedly. "Life? Responsibilities? Reality? Fear of what lies ahead. Fear of leaving what is conventional. Fear of being judged. Fear or failing. Fear of going hungry, thirsty, without shelter. Fear of having not enough," I answered, feeling rather dejected. At the end of the day, I was too afraid. Too tied down. I sighed. The voice sighed. And we sat down together, thinking of all the things we can do if I do pick up the courage and walk out of my door with only a backpack, never to return. Yet we were fearful of the uncertainty as well. The world is a dark place, and aside from all the good things, there were bad things as well. Above everything, I wanted to feel secure, I wanted to be safe. And more often than not, safety and security of life on earth can only be bought using only one thing. This thing called money. Either indirectly or directly. Unless you're living out alone in the forest with no human contact or whatsoever, you need money. It's the easier way to be safe, to have power, to have security and to ensure your life doesn't plunge into a whole mess of uncertainty. Which was why I chose the safer path. The easier path. The path most take. To earn money first. Then only earn a living. Money first, life second. "What if money was no object?" asks Alan Watts. Such an easy question to answer. All of us know what we want to do if money was no object. "Go and do what you want then, and make a living out of it," he added. Again an easy statement to say, but can we really do it? Can society really function if all of us forgo the idea of money, and do whatever it is we want to do? Like it or not, the answer would be no. Not really. Society will descend into anarchy. Maybe only a small percentage of people can afford to live life according to what they please, what they love, but not all of us. Can you imagine how it would be like if all of us are bosses, with our own companies? Who will be the ones working for us then? Or can you imagine if everyone becomes head of a nation? Who is left to govern? Sure, you might say that not everyone shares the same interest, that everyone has their own interests. And it it is through the different interests that people find their niche, but tell me, how many of us actually enjoys farming or other low end jobs like cleaning? Even if there is, I am sure that the proportion here would be skewed. More people would rather be a boss than a cleaner, that is for sure. "Unskilled" jobs such a laborers, cleaners and security guards will forever be deemed less desirable, due to the stigma that is attached to it. Unless all jobs can be paid equally, the mantra of doing what you like is nothing but a pure hogwash that washes the blame off from what is really wrong: Our society. A viewpoint that it is up to the individual to decide his path is reductionistic and naive. It places the focus purely on the individual and negates the effect the society has on the individual. A person who is stuck in a job he hates? It must be because he is not daring enough to pursue his own dreams. It is his fault for choosing what he is living now, instead of what the society forced him to do. It blames the individual squarely for the outcome of his life. No other factors are considered. Not the fact that the society views unconventional jobs such as writing, painting or cleaning with a suspicious eye. Not the fact that perhaps unemployment rate is at all time high. "Do what you love" is nothing but masturbatory notion. It makes yourself feel good, without focusing on the deeper issues that matter. Why is the world so unfair? Why are some jobs paid lesser than others? Are there different values attached to different jobs? Is a cleaner worth much lesser than a finance executive? Are they not equal? How do we nurture the interest of the young, so not everyone would want to be a finance executive, but a cleaner as well? Is there any way we can make it equal? Argue it as much as you like, but society cannot function without people growing food, without people building our houses, without people cleaning our waste. 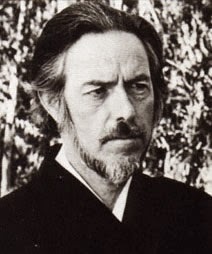 What Alan Watts essentially is advocating as well, the becoming masters in what we do part, is no different from the societal values that we currently have. It holds that there are people with unequal abilities, and those with better abilities, the masters, can afford to charge other more, to earn more. The unfairness basically still exists. It does not solve the problem that money brings out. Society is still screwed. "Do what you love" works well on an individual level, for the more privileged. It gives you the illusion that you can just walk out and do what you love, and be happy about it, but it holds a lot of assumption in it for it to truly work. It assumes that the society is fair, that if everyone is allowed to do what they want everyone would be happy and society will still function, but it does not take into account the bare minimum that society needs to function. But it does not address the fact that in order for you to have value, you must be better than someone else. You cannot just do what you love to be able to succeed in life, you must be good in it. What happens if you love sleeping for example, or just sitting under the sun? No, those could not work. You must be able to market something, something that makes you stand out from the rest, only that way you could live. Or earn to live. Someone will succeed in doing what they love, many will not. In the end, many of us will resort to do things that we don't really like in order to survive, because that how life works. One cannot simply survive on passion alone. It is an interesting concept to have, but I really do wonder if everyone of us, the six billion people on earth, can really do what we love, and society will continue to progress. With the current system we have, I highly doubt so. If money ain't an object, then the world would be in greater chaos.